Instagram has rolled out a new feature - an algorithm-based personalized feed for users. They’re shifting away from the reverse-chronological order to a much more user-friendly system. The order of photos and videos in a user’s feed will be based on the likelihood they’ll be interested in the content -- similar to what Facebook has done with its news feed. This is big news! Marketers are responding quickly to the change, trying to find ways adapt to the algorithm. This is no surprise, given that marketers LOVE Instagram. Even at a quick glance, statistics show why. The amount of people using Instagram has seen a sharp rise. According to Statista, the total number of users in January 2013 was around 90 million. Just three years later, in September 2015, it reached a staggering 400 million users. Here’s the icing on the cake: It’s not only the numbers of users that’s impressive. Engagement that brands get from their Instagram followers leaves other social media channels far behind. 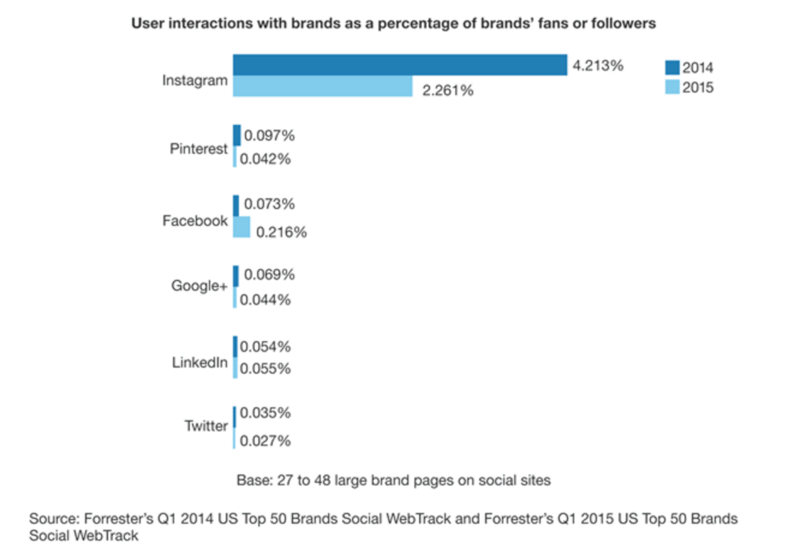 People love to chat with their favorite brands on Instagram. Forrester Research, Inc. published the “How Top Brands Are Using Facebook, Twitter, And Instagram” report. The findings show that when it comes to engagement, Instagram is king. When Instagram opened up its feed to advertisers, it became the perfect avenue to create a buzz around your product or brand, and reach your buyer persona. 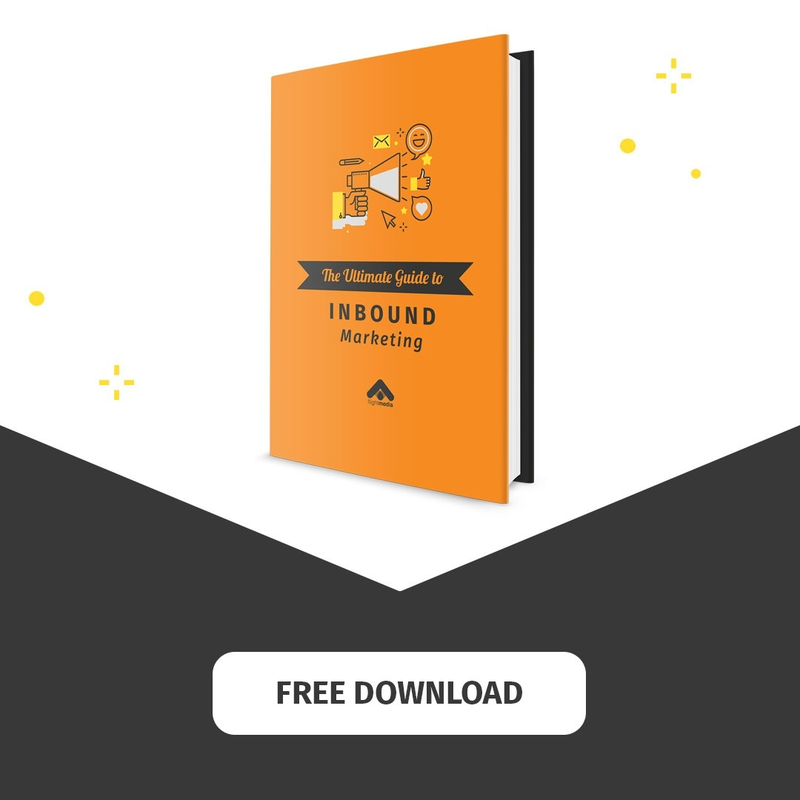 Chances are your targeted audience is among those 700+ million of users, and you definitely want to be where they are. The logic is easy on this: Having more followers on Instagram can mean more visitors to your website, more leads, and more sales. Even if it doesn’t impact your sales directly, it will ease up the sales funnel by creating a stronger community for your brand, thus helping you reach your goals in the long run. 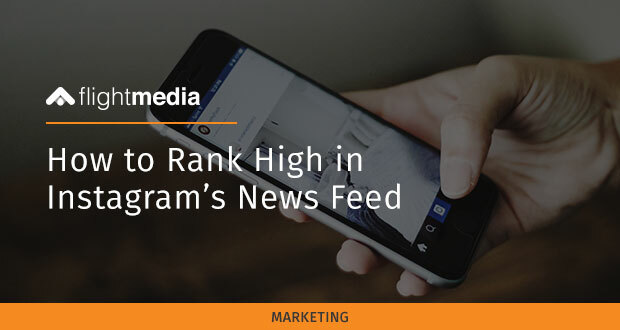 Now, with this new feature, you really have to deliver: In order to have a successful Instagram account and rank high in your audience’s newsfeed, your audiences needs to want the content you’re delivering. Your strategy has to be amazing, attracting new people and delighting current followers, driven by the goal of bringing in more sales. The new algorithm dictates that your Instagram must be fabulous, IF you want to get ROI from the effort and resources your marketing team puts into the project. Before we dig into the action steps that will up your game to the next level, let’s go over the basic checklist. This list applies to every single social media network out there, so double check that everything is OK before you take off. Make sure that your profile is complete and includes a link to your website. Use widgets on your website that will make it super simple for people to follow you. Cross-promote your profiles on different networks – use what you have already built! Use appropriate graphics for your profile and cover image, if the platform allows. Now that we covered the basics, let’s dive into the action steps. 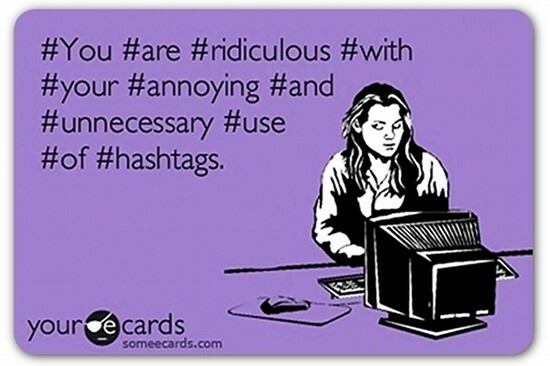 As a marketer, you may question hashtags and their importance. Some think they’re spammy, while others see them as their best research and networking tool. The truth? It depends on how and where you use them. This network is almost fully driven by hashtags, so on Instagram, they are a must. They help users find your content, which is the first step in the process of turning a stranger into customer. Be mindful: You need to get in front of your buyer persona because they want what you’re offering — not because you want to profit. Intrusive marketing is boring, annoying and ineffective. With this Instagram’s feature, your posts will be buried somewhere deep in their newsfeed unless you provide excellent content that is easy to find and engages users. Hashtags are a great way of getting found on Instagram. Focusing on relevant terms will bring to you a targeted audience interested in what you have to offer. These are the people that want you in the top posts of their Instagram news feed. Don’t overuse hashtags in the hopes of snagging lots of eyeballs on your content. This approach will only serve to turn people away. Do your research. What is your buyer persona talking about? What are they posting and which hashtags are they using? When researching your target audience, approach it from a problem-solving perspective. Find a way to offer value and help, instead of only trying to promote yourself. Use three types of hashtags: brand-related hashtags, industry hashtags, and trending hashtags. The combination will bring the best results. Your shoe company “AAA” specializes in women’s footwear. You want to post image of sandals. 3. Never use spam hashtags such as #likeforlike, #followforfollow, #likeme etc. This will crush your credibility and image in no time, and all the effort made to position yourself correctly will be in vain. You already know that Instagram has no competition when it comes to engagement. In order to propel your influence and overall success, you should leverage this fact. Instagram posts generate a per-follower engagement rate of 4.21 percent. This means that brands and companies get 58 times more engagement per follower compared to Facebook, and 120 times more engagement per follower compared to Twitter. Posting engaging content and taking the time to respond and reach out to your audience are the keys to success on this network. Keep in mind that to like something on Instagram, it takes less than a second. Just a simple double-tap on the screen. Even though likes are good, your audience knows how easy it is to “like” a post. As a result, they will almost always value comments more. And there’s no way to respond to a like, so this type of engagement can get buried pretty easily. That’s why leaving a meaningful comment is always the better option. It does require more effort and it isn’t that quick, but the results will be much better. When you comment in a post, you’ll stand out and start a conversation. Being personal and human in engaging should be your main Instagram strategy. Also, it will help you differentiate yourself. 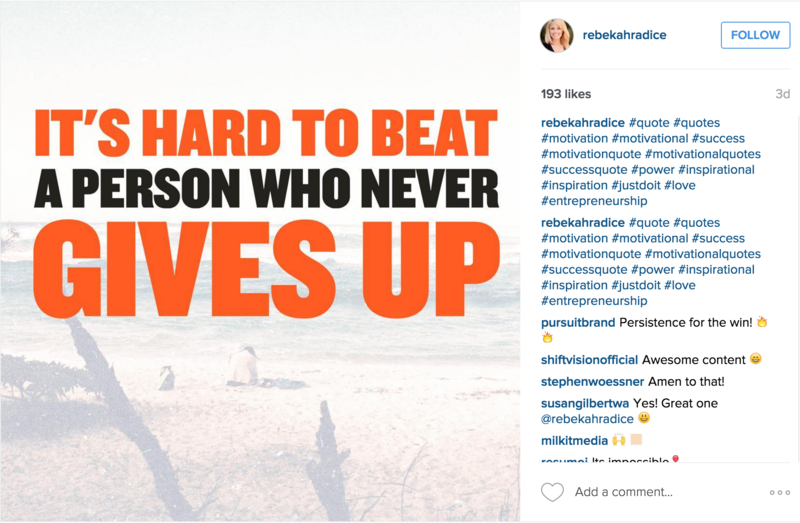 The image above, posted by Rebekah Radice, got 193 likes and 8 comments. By simply liking it, you’d drown in the sea of other likes. The competition is much lower in the comments area. Use that and attract the spotlight to you. One of Instagram’s stars, Chalene Johnson, uses a very simple 5/3/1 engagement technique to build her following. It’s super easy: Like 5 posts, leave 3 comments, get 1 follower. Simple, right? Respond to everyone. They took the time to write, so you should take the time to answer. Always use @mention when responding or leaving comment. If you don’t, only the owner of the graphic will actually get notified, not the actual person you tried to talk to. Leave a meaningful comment. Stay away from generic replies such as “Thanks!”, “Great!” or “Wow!” Show that you are human, friendly and fun to talk to! Ask questions. Open-ended questions are a great way to spark conversation. Take your time, reach out to people and respond. You will love the impact it will have on your overall Instagram success. Instagram is the perfect avenue for raising brand awareness and strengthening your brand’s blueprint. Use its dominant visual focus to tell company’s story and showcase what you’re all about. Tell a story. Instead of being all over the place, focus on conveying your message. Are you all about fun and excitement? Health? Business success? Leadership? Whatever it is that your company stands for, showcase it through your posts. Provide a story that others can relate to. Make it recognizable. Use your colors, logo, fonts — anything that distinguishes your brand’s visual identity. Use branded images. If you want to share a quote that inspired you or you think it will suit your audience, brand it. Create several graphics that can serve as templates to which you add text as needed. Share Behind-the-Scenes content. Instagram is fun! Show bloopers, behind-the-scenes clips, office atmosphere or anything else that humanizes your brand. Sure, it’s your company’s profile, but the company is made up of people. And people connect with people. Behind-the-scenes content is an excellent way to reach out to your audience in a friendly, fun, human way and thus strengthen your relationships. 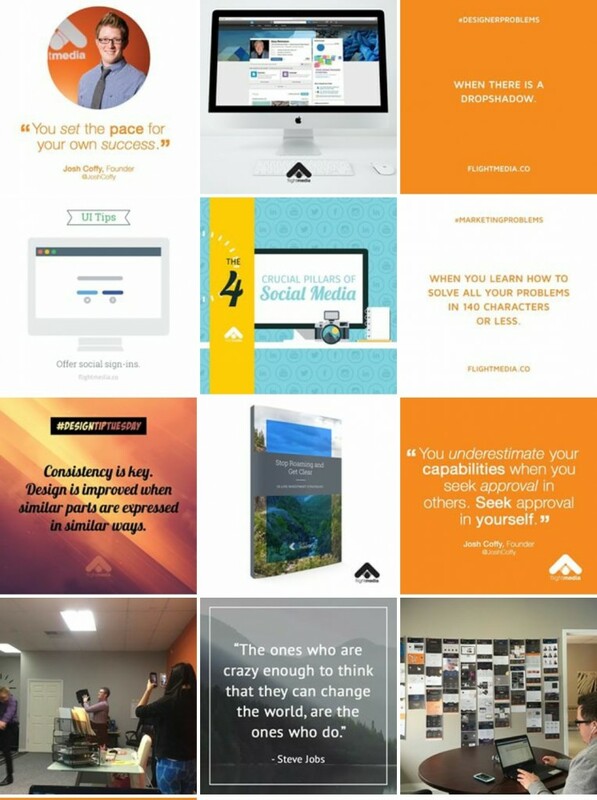 This is part of Flight Media's Instagram Feed. We share our BTS, what motivates us, tips and ideas, and so much more. Everything branded, conveying the same message. When it comes to the quality of your content, being lazy is a recipe for disaster. Poor-quality content drags down engagement and makes your whole brand look like a second-rate organization. All of your efforts to position yourself as a top brand are easily undermined by half-hearted attempts at building a brand profile on Instagram. If you’re going to build your presence, do it right. Create your own content, according to your brand, mission, and strategy. Whether it’s a graphic or an actual photo, ensure top-notch quality. Gorgeous images and visuals are why users love this network in the first place! Inspire, motivate, reward or solve problems. When creating content think about your buyer persona. What would they appreciate and engage with? Provide value through each post you publish, either by sharing quotes they’ll relate to, new blog articles and other news, or even rewards and discounts! Or simply make them laugh. Remember, it’s all about them. Reward your followers by providing content they can benefit from. Don’t spam. Create a posting schedule and stick to it. Posting one time per day is a great goal to aspire to. You don’t need to post 10 times a day to draw attention to yourself. More likely, you’ll make people feel super annoyed and bored, and they’ll be quick to unfollow. Choose quality over quantity every single time. Keep it branded. Your content should convey your brand’s message with ease and without exception. Not to mention that once your content gets reposted, you’ll get free advertisement! Now’s the time to take the full plunge into Instagram and ensure success for your brand. Check your Instagram profile and feed, and adapt what you have to get more exposure. What have you done to upgrade your Instagram strategy?